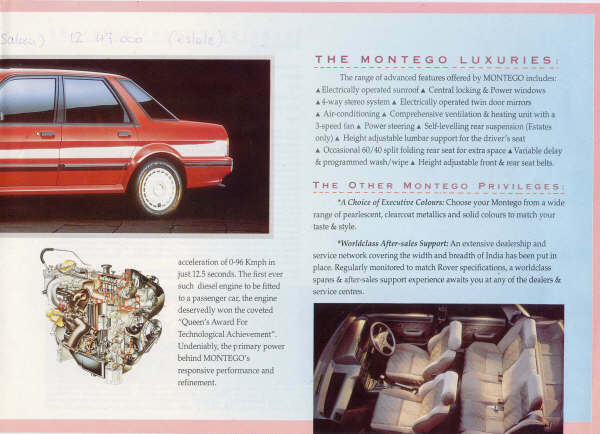 Sipani Montego – did you know they made the Rover Montego in India? A couple of years after production had ceased in the UK, the Rover version of the Austin Montego was re-introduced in the Indian subcontinent in order to compete in the executive car market. When BMW bought the Rover Group in 1994, it has been said many times that Bernd Pischetsrieder was surprised to find the antiquated Montego and its hatchback sister, the Maestro, were still being produced. This piece of modern motoring folklore has become almost a legend, but the truth of the matter was that the Montego and Maestro were due to finish production within the year. Rover had been planning to extend the life of these cars by looking east. The plan for the Maestro to go to Bulgaria had been in place for some time, and then came the opportunity for Montego to be assembled in India (both operations would involve the assembly of kits shipped from Cowley). 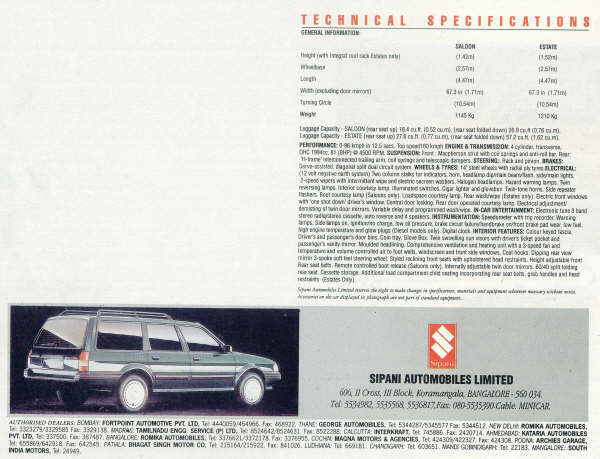 During the early 1990s, a deal was struck with Bangalore-based Sipani Automobiles, whereby saloons and estates would be exported in SKD form (semi-knocked down) to be assembled in India and sold through the Sipani subsidiary, Dolphin Motors Limited. These cars were all built in Cowley during 1994 and were complete, save for a few locally-produced components, such as batteries and air conditioning. But when the first cars arrived Sipani had problems getting customs clearance despite a deal having been reached with the authorities prior to shipment on the basis that local content would be increased later with hopefully local production the eventual target. Because of these problems, when the Montego went on sale in India, it was subject to higher duties, and this meant that prices were higher than planned for. Putting the high price into perspective, the Montego cost 10 times the price of the basic Maruti and seven times that of the Hindustan Ambassador. Sipani itself did not have much of a reputation as a car maker or car retailer. 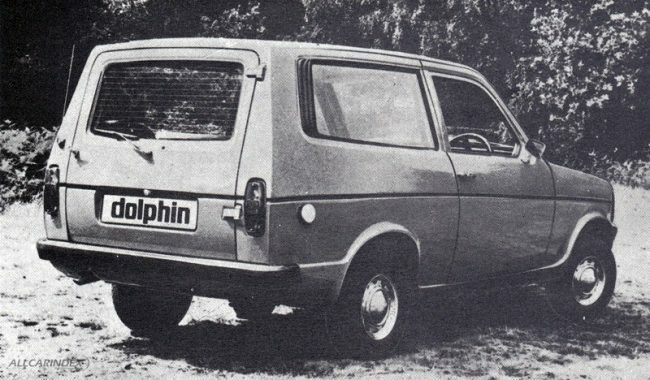 It had only made small numbers of the Reliant Kitten-based Dolphin (above) and, despite the high price of the Montego, Sipani could offer little more than a tiny network of workshop-style dealers. Another factor in the failure of the Montego was that it was considered by potential buyers as being an old car that had gone out production back in Europe. Indian buyers’ tastes had become more sophisticated, and they demanded more. 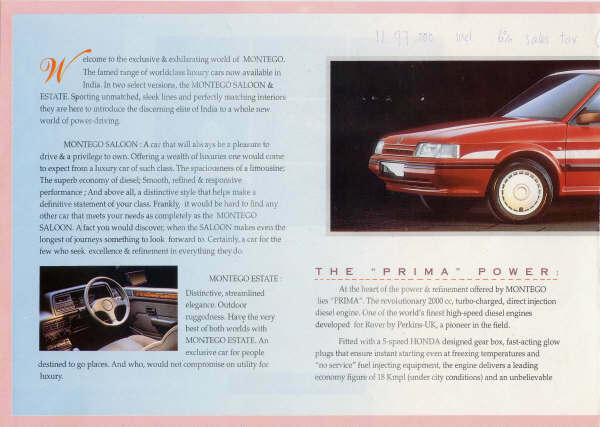 Sipani decided that, in order to counter its own bad name, they would market the car as the ‘Rover Montego’. The Rover Montego nevertheless found its place at the premium end of the Indian market, where it sat comfortably above the workaday cars from Hindustan, Maruti and Premier, with a suitably hefty price tag. Compared with the archaic Hindustan Ambassador and Premier Padmini he was used to, the average Indian buyer would have seen the diesel-engined Montego as being up-to-date, and well specified, even though its specification was the same as that of the last UK-built Montego Clubman from 1994-95. 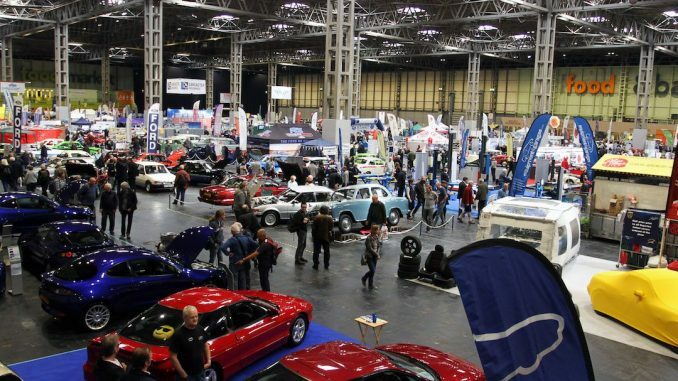 By 1995, the Indian car market was being liberalised and several other companies set up production facilities, including Daewoo (with its 1984 GM Astra/Kadett -based Cielo), Ford and Opel. Daewoo were the first volume producer to set up shop in India and planned to build 50,000 Cielos a year from 1995, but Daewoo also encountered problems, and, despite the fact the Cielo was a third of a price of the Montego, it never managed to outsell the trusty old Hindustan Ambassador. The newly-liberalised market meant that the Montego faced stiffer opposition than Sipani would ever have anticipated and, despite great promise it never took off: in its first full year, just 236 Rover Montegos were sold, in both body styles, and its appeal rapidly faded. A total of 500 Montegos (approximately split 50/50 saloons to estates – all Clubman diesels) were shipped to India during 1994 and 1995, and the last 51 units were sold in 1998. With thanks to James Robinson for extra information, pictures and sales figures. 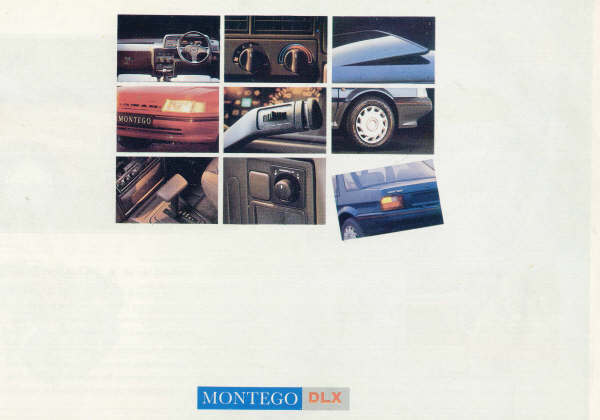 Thanks to Paul Blokland for the Montego brochure. We had to ‘cow-proof’ the front doors! Those wheeltrims look like the Halfords specials I threw onto a Citroen about 10 years ago. interesting feature, be a good car especially the estate version out there,mind you like the earlier reply is there still any around, getting rare in the uk. From memory as a maintenance fitter on M Series assembly, up to 1994, the only other Montego’s with air con were a batch built in the late 80’s for Taiwan. These were something special, they had a 1700 “O” series engine (not the 2 litre) to power the extras, green tint glass and roller blinds fixed to the rear shelf. I think they were all saloons although it was a long time ago. No longer in assembly but still at the MINI Plant! I remember the launch of these being featured on the India episode of ‘Jeremy Clarkson’s Motorworld’ in 1995.